Portable bidets are one of the coolest things ever invented. As more and more people live mobile lifestyles, we suspect this kind of product will enjoy greater popularity. If you’re used to using a toilet seat bidet in your home, not being able to use one outside of home is disappointing to say the least. 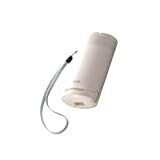 Luckily there are portable bidets that you can take with you, whether to work, for travel or camping, or on a cruise. The only downside is that you don’t have many good products to choose from, possibly because bidets are still relatively new in North America and portable travel bidets all the more. That said, we’ve chosen some of the best travel bidets on the market today that we want to share with you below. The Brondell GS-70 travel bidet is a simple product that works. We would describe it has a squeeze bottle with a stick. To use, you would fill the bottle with water and spray by squeezing the bottle. The water will come out of the stick nozzle which has five tiny water holes. Given the design, you have to be careful not to squeeze the bottle before you’re ready. Otherwise you’ll splash yourself. The one downside with the GS-70 is you can’t pre-fill the bottle to carry around so you need to find a water supply right before you use it. This can be an issue for some. The bidet holds 400ml of water so about the same as a small disposable water bottle. This should be plenty to clean with. It comes with a carrying bag which is great if you want to be discreet about carrying this around in public. 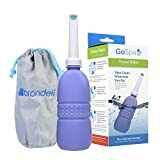 We do think there are some areas where this product can be improved, but considering the price and the performance, the Brondell GS-70 is about as good of a portable bidet as you will find. The SmarterFresh is similar in design to the Brondell GS-70, except the SmarterFresh has a larger water capacity and an angled nozzle mouth. It can hold up to 650ml of water. The angled mouth means you would hold the bottle differently than the Brondell GS-70. In our opinion it’s not a matter of which design is better, but which one you feel most comfortable using. The nozzle on the SmarterFresh is 7.5 inches long and the one cool thing about it is you can tuck the nozzle into the bottle to store away. There is also an “air lock” feature where you can place a finger to stop the water from potentially leaking when turning the bottle around. The SmarterFresh also comes with a carrying bag. It works just as well as the Brondell GS-70, so this is another option you can consider. The final travel bidet we want to talk about is a completely different product than the previous two. The Toto HW300 Travel Washlet. It’s one of the most advanced travel bidets that you can get, offering maximum comfort. First of all, it’s an electric travel bidet. You will need to insert one AA battery to use it. To use, you first fill the little tank with water. The good thing about this travel bidet is you can pre-fill the water and as long as you don’t leave the nozzle out, it won’t leak. Then you would pull the nozzle out and when you are ready to spray, you would push the button to switch it on. The tank doesn’t have to be full to use. And if there’s still water left after you finish using it, just turn the switch on to empty the water. The one great thing about this device is you can adjust the water pressure. You can slide the cover of the wand to the desired water pressure setting. It clicks into place. As you can see, the Toto HW300 travel bidet gives you a more accurate and comfortable wash, because with the other travel bidets you might squeeze too hard or not hard enough and it’s not as consistent. That said, the Toto does come with a higher price tag. One last thing we want to mention is that you can pour either cold or warm water inside all these travel bidets. Just be careful not to put anything too hot. We don’t recommend going over 40°C (104°F).